[ Since fossil fuels are finite, biomass doesn’t scale up, hydrogen is an energy sink, transportation in the future will need to be electrified, especially trucks, which are the most essential and important part of civilization, responsible for supply chains, agriculture, mining, construction, and so on. There hasn’t been much progress in batteries the past 200 years. Electric cars still cost about twice as much as gasoline cars. But who cares about cars? Civilization depends on heavy-duty trucks, rail, and ships that are the basis of all supply chains, mining, agriculture, logging, construction industries, and infrastructure. Batteries are simply not as energy dense as oil and never will be. Pound for pound, oil is 500 times more energy dense than a lead-acid battery and about 120 times more than a lithium-ion battery. That makes them too heavy to move a heavy-duty truck or other large vehicle. One of the main problems with batteries is that they’re too heavy, especially for the heavy-duty vehicles and equipment that civilization depends on. We’ve already gained as much energy density as possible by switching to lighter and lighter elements — from lead to zinc to nickel to lithium. Consider that when you hear about yet another battery improvement. There’s nowhere to go from here, lithium is the lightest element we can make batteries out of, with only hydrogen and helium being lighter. Lithium is much lighter than lead at 82, zinc at 30, and nickel at 28. At the very best, scientists estimate that we could get double or triple lithium-ion performance due to the laws of physics. Nor is there enough lithium in the world to switch from gas and diesel vehicles to electric vehicles running on lithium batteries (Vikström, H. et al. 2013). And especially not if batteries are built to store energy for when the wind and sun aren’t out. On average at least six weeks of energy storage would be needed for a 100% renewable grid. To store just one day of U.S. electricity generation, Li-ion batteries would cost $11.9 trillion dollars, take up 345 square miles, and weigh 74 million tons (DOE/EPRI 2013). There are other battery types, but commercial development is focused on lithium almost entirely. The very heavy, 4,647 pound Tesla Model S gets most of its mileage from aerodynamics, reduced rolling resistance, light-weight materials, and so on. The Tesla S goes further than other all-electric cars because it has more batteries. Tesla S battery packs weigh 1,323 pounds (plus 350 lbs for the electric motor and inverter) versus 660 lbs for the Nissan Leaf (also pretty heavy at 3,340 lbs). So let’s start over and design a high-energy battery from scratch. The first step is to look at the periodic table to choose the best elements. 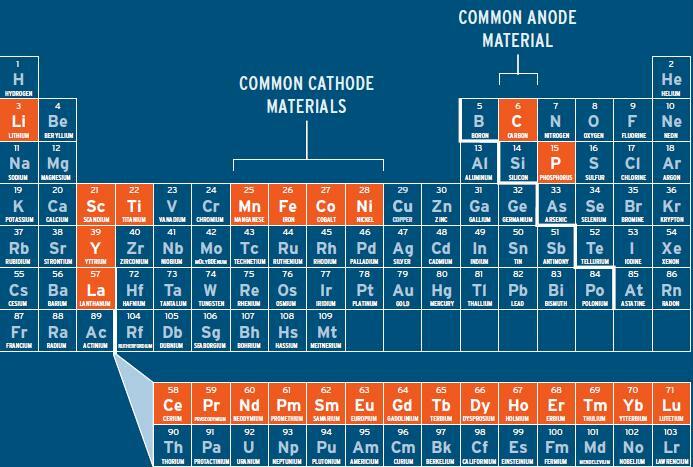 Another possibility is looking at what elements could produce the highest voltage from the most reducing and most oxidizing elements. The highest potential is nearly 6 volts with a lithium anode (the strongest reducing element) and a fluorine cathode (strongest oxidizing element) of -3.04 & 2.87 respectively). Battery researchers know this and have been trying to develop such a battery since the 1960s. Scrosati et al have an excellent history of Li-F battery research and where we stand on different battery types today if you want to know the technical details. The laws of physics means that there is no possibility of making a battery that rivals the energy density of oil, ever. So the question is, if a 6 volt lithium-fluorine battery could be built — and it probably can’t — but if it could, would it be energetically cheap and powerful enough to move heavy-duty class 7 & 8 all-electric tractors, harvesters, road construction, and mining trucks? If so, then is there enough lithium on the planet, including recycling, to make enough batteries for all electric cars, trucks, and utility-scale energy storage and lithium-battery mining trucks to haul ore to refining plants, and so on? Scrosati, B., et al. 2013. Lithium batteries. Advanced technologies and applications. Wiley. Vikström, H. et al. 2013. Lithium availability and future production outlooks. Applied Energy, 110(10): 252-266. This entry was posted in Electric Cars, Electric trucks impossible, Lithium-ion and tagged batteries, electric truck, elements, lithium-ion battery, oxidation, periodic table, reduction. Bookmark the permalink. An advantage that oil has is that the oxygen for burning it can usually be obtained from air (exceptions include submarines while submerged). However oil is still more energy dense if you count both reactants. Diesel fuel, ounce for ounce, has over 90 times more energy density than the typical BEV li-ion battery, the LFP (LiFePO4) — 12,700 Wh/kg diesel versus 140 Wh/kg LFP. The main problem with low energy density is that an 88,185 pound long haul diesel truck can go 621 miles carrying 59,525 pounds of cargo. But a 2,500 kWh battery having energy density .1 kWh/kg, .14 kWh/liter, 80% depth of discharge (current level of technology) would cost $1.5 to $2 million dollars and weigh 55,116 pounds, almost 93% of the max cargo weight, and take up over 25% of a 40 foot container. Clearly money is somewhat related to energy density, because the companies building delivery BEV trucks (battery electric vehicle) have gone out of business (Smith electric late 2013) or dropped their electric truck business (Navistar), and their battery maker, A123, is also out of business, despite hundreds of millions of dollars in overall government grants AND federal and state subsidies to the buyers that made up the difference between a diesel and electric truck. This is why ENERGY DENSITY matters more than money! Electric trucks CAN be built – but so can a life-sized white house out of sugar cubes, until the energy to harvest, process, and deliver sugar cubes to your local store declines so much that this stops happening (which in our current system will be manifested as sugar companies going out of business, when the real cause is lack of energy). Interesting link, thanks for sharing. There is only one vehicle that looks sorta like a conventional semi-truck, the Newton at the bottom. The claimed range is 55 miles to 110 miles; claimed top speed is 50mph. The max weight configuration is 12,000 lbs (probably 55 mile range for the heavy model). Compare to this page which says that conventional tractor-trailers range from 12,100 to 80,000 pounds. I also know from experience diesel trailers can sometimes push 70mph and I’m guessing their range is a heck of a lot more than 55 miles (energyskeptic mentioned 621 miles). Not sure how the cost of ownership compares, but I thought it was interesting to look at the limitations of an actual electric truck. Batteries cost $600-$800 per kWh and weigh about 22 kg per kWh – they’re far too expensive and heavy and large even for delivery vans. Because of all the zero emission money and other government grants, delivery e-trucks are getting made that are 2-3 times more expensive than an equivalent diesel truck and have much shorter ranges. To charge just one 25 kWh battery pack in 5 minutes requires a power flow rate of 300 kW, equal to the peak power demand of a 100,000 square foot office building — where the hell would the electricity come from if they were scaled up commercially? Alice (energyskeptic), your knowledge of chemistry seems to be a bit limited. Alkali metals (and indeed most other metals) have a greater reducing potential the further down the periodic table you go. So if reactivity were the deciding factor, caesium would be the best choice (francium’s not an option because it’s radioactive, extremely rare and very short lived). If cost is the deciding factor, sodium’s a better choice. But lithium is usually preferable for batteries because it’s lightweight; the higher specific energy more than makes up for the lower energy density. But there are more factors to consider. Alkali metals only have one electron each. Something with more outer shell electrons could be more effective. Vanadium (with five) is often used in wet cells. As for fluorine, forget it! Fluorine gas is far too dangerous to have in batteries, and oxygen fluorides are also dangerous and difficult to work with. I’m amazed that anyone’s even contemplated it. Unlike fluorine, cadmium can be contained fairly easily, so has been used for batteries despite its toxicity. Ultimately you’re asking the wrong question, focussing on the inability not the ability. There are some transport applications for which batteries are not suited and will never be ideal. If you need a 621 mile range then you’re better off sticking with an engine and fuel. Likewise for tractors and harvesters. But if the truck’s only used for drayage or local deliveries then a lower range isn’t a big problem and the benefits of regenerative braking and quiet operation could be significant. And if it’s just used for transporting large objects to work sites, range requirements would be even lower. Thank you, I admit that I find battery chemistry confusing, but I was convinced about the volt differential as the most important factor, but from your point of view, apparently not? I would argue strongly that cadmium and other toxic metals, and rare earth or metals limited long-term should be avoided if anyone is serious about batteries long-term. Lithium is questionable on that score. Certainly for utility scale energy storage. The Port of LA and Long Beach drayage ZE project haven’t found an alternative kind of drayage truck that has a good business case. Truckers only get $100 a trip and can only make 3 to 5 trips a day, and use $3,000 old trucks to make it pay off – BEV trucks cost $307,890 dollars now (a new diesel $104,000) and can only go 100 miles and need to be recharged every 2 hours or less. Fast-charging in 30 minutes might shorten battery lifespan, whereas diesel trucks go 621 miles and only need to be refilled every 2 to 4 DAYS.. Many of the companies making more suitable delivery class 3-6 trucks went out of business despite massive government grants and subsidies to buyers to make up the high cost difference between the diesel and battery truck. I don’t know why they’re even bothering to make trucks before there’s a decent battery that would make a viable business case. With ten year development time to improve a battery slightly, and peak conventional oil having happened in 2005-6 and USA fracked oil not compensating for much longer, we’re running out of time for a REVOLUTIONARY 5 to 10 times more energy dense battery that lasts 10 years. The research money is all going to CAR batteries, and any improvements there don’t easily or quickly translate to trucks. Cars are toys, the money should be going to essential freight vehicles, because once gas is rationed there won’t be many cars on the road.